When I ask Sales People what percentage of the time the customer should be talking, they typically say 70%. But in reality they do 70% of the talking. This is because they launch into a boring company presentation at the first opportunity and talk about the features and benefits of their solution before they understand the real issues the customer is facing. The issues behind this are 3 fold; a lack of preparation, failure to use Meeting Planning tools and not having the right questions to ask to get the customer talking. The outcomes you want from a meeting with a customer are firstly, they trust you and feel comfortable in answering your questions. Secondly, they have given you information vital to designing your solution and thirdly, you can access other members of the Buying Centre to understand their needs as well before submitting your proposal. These are outcomes that result from a mutually beneficial conversation – not a presentation. And you get to manage that conversation by asking the right questions. What are the right questions? 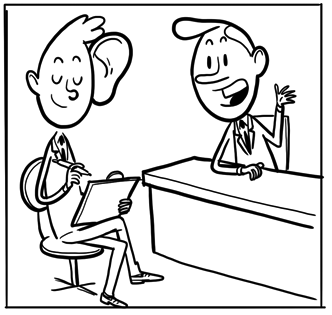 That’s where your Appointment One-Pager comes in. 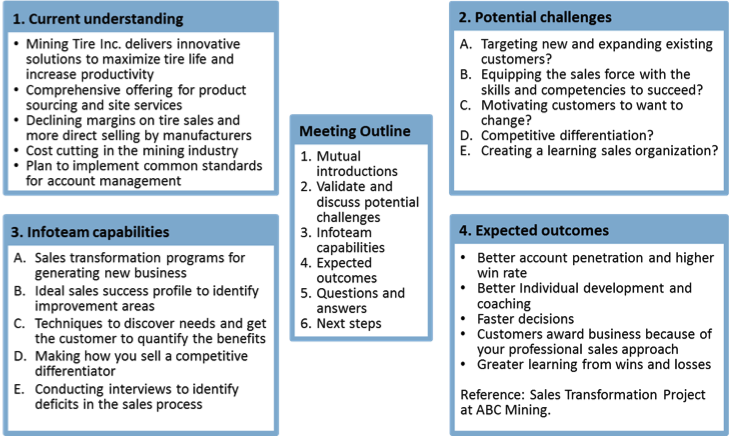 To help you establish trust and improve the outcome of customer meetings, we recommend that you use an Appointment One-Pager. Putting together the Appointment One-Pager is the preparation you need to do before the meeting. It puts you in a position where you can validate and deepen your understanding of the customer’s business and challenges before talking about your capabilities. It demonstrates your good preparation and helps you to structure the flow of the meeting. After the mutual introductions and agreeing on the agenda, you should start by validating your understanding of their business and potential challenges by asking questions. This is a crucial way to earn trust and demonstrate your professional preparation. The closer the potential challenges are to the customer’s real challenges the better. The better your questions, the more you will find out about the customer’s pain points before talking about your own capabilities. This sounds like a lot of work, but developing a good Question Bank can reduce the amount of effort. In a sales team workshop, try working through the following points. What job titles/positions do the people you sell to have? What are the potential challenges that each role might face (relevant to your solutions)? What are the typical causes of each challenge? What questions could you ask to validate each challenge? What do your capabilities to address this challenge look like (assuming that your hypotheses are confirmed)? What results can the customer expect (substantiated with an example)? Let me go through an example for a role that is typically in the Buying Centre for Infoteam’s services. 2) Potential challenges: Large deals in the forecast are failing to close. 3) Causes: Lack of relationships with the real decision makers and poor understanding about where the customer is in their buying process. 4) Questions to validate and deepen understanding of the potential challenges e.g. How often do you lose deals because you lack relationships with the final decision makers? What impact does this have on forecast reliability? How much revenue is lost as a result of this issue? What impact does this issue have on other departments? If you could reduce the frequency of this problem by 25% how much additional revenue could you achieve? Based on your typical margin, what would this translate into in terms of net profit? Other potential challenges facing a Sales Manager could be pursuing the wrong opportunities or recruiting Salespeople that don’t have the right competencies. Your industry experience and company research will help you tailor these issues to the specific customer and their business situation. This process should be repeated for each of the roles involved in buying decisions and could even be extended to cover different industries. If we are meeting an HR manager for instance, the potential challenges could be making sure that training sticks or the quality of the on-boarding program which in turn impacts the time it takes new Salespeople to be successful. The pain points of a Sales Manager in the software industry will be different than the pain points of a Sales Manager at a food manufacturer. That's why it is so worthwhile building up a Question Bank and tagging each question by role and industry. Creating and updating your Question Bank is a worthwhile investment. It shortens the time it takes to prepare customer meetings well. Even if you have to tailor the potential challenges and questions to the specific customer you have saved yourself some work. And when it comes to the meeting itself you can do less talking and listen to your customer tell you about his needs. Are you planning your appointments as effectively as you could be? Do you come out of appointments with the feeling that you talked too much? Would well-prepared questions help you to do a better job?